Will Apple Offer a Subscription Music Service (and Steve Jobs Eat Crow)? How much will the recession hurt tech? Will subscription music ever take off? Do Facebook’s privacy controls solve the problem of too much info on the Web? Plus, March Madness picks in this week’s Digital Dish from BusinessWeek reporters Spencer Ante, Heather Green, Arik Hessehdahl and Catherine Holahan. Does AOL Have a Strategy? Check out this week’s Digital Dish, where BusinessWeek reporters Spencer Ante, Heather Green, Arik Hesseldahl and Catherine Holahan discuss AOL’s buy of Bebo.com, the endgame in the Microsoft-Yahoo! mating dance and a South by Southwest wrap-up. It’s not all about the parties (really). A little more than a week ago, I created an AdWords campaign for my book on Google. Before this, I was a keyword virgin. Here’s the one thing I don’t like about it: I HAVE NO IDEA IF THE CLICKS ARE GENERATING SALES OF MY BOOK. The reason? Google offers so-called conversion tracking that lets gauge this data, but in order for the feature to work you have to install some code on the landing page where your product is offered for sale. Problem is, Amazon.com does not, as far as I know, allow users to install code on their Web pages. I emailed Amazon about this over the weekend; maybe there is a fix. I hope so. In any event, this points to the bigger problem facing Google. The clickthrough–Google’s nirvana that generates almost all of its revenue–is falling out of a favor a bit. What advertisers and marketers really want is conversion. And Google and other search/online marketers will probably have to adjust their business models to shift more towards getting paid for conversion, rather than mere clicks. Read this BusinessWeek story by Catherine Holahan and I to learn more about the trouble with clicks. BusinessWeek puts the gloves on for tech fight night. In this week’s Digital Dish, BW reporters Spencer Ante, Heather Green, Arik Hesseldahl, and Catherine Holahan debate whether Microsoft, Google and Sprint deserve the whuppings they got this week. Plus, from the department of weird leading indicators, the Dish talks about the ginormous tab for Steve Jobs’ private corporate jet. 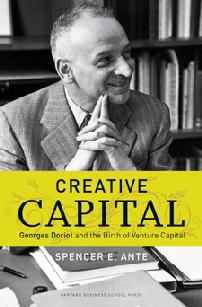 HOW TO BUY CREATIVE CAPITAL: To pre-order Creative Capital and get a 34% discount, click here and go to Amazon.com. Did Steve Jobs Miss the Bullseye at Macworld? BusinessWeek technology reporters Heather Green, Arik Hesseldahl, Catherine Holahan and Spencer Ante discuss Macworld, whether the tech sector is headed for a downturn, and the billion-dollar-plus buys of MySQL and BEA in this week’s broadcast of the Digital Dish. My colleague Arik is bullish on the future prospects of Apple’s new online movie rental service. But I am less optimistic. Apple TV will get better and do better but it’s not a groundbreaking product like iTunes/iPod or the iPhone. Jobs can’t ride into the local square and save the day because there are already a few sheriffs in town. Netflix is the dominant player in online movie rentals and they are offering a download service for FREE with 6,000 movies and TV shows right now. Interestingly, the top five most-watched shows are all TV programs, according to the list on the NetFlix Web site on January 19: Heroes, The Office and 30 Rock. As for Macworld, the maestro Jobs turned in a middling performance. He was due for one, no doubt. That’s the nature of creativity. Every film Martin Scorses makes can’t be a masterpiece like Raging Bull or Taxi Driver. Every once in a while you’re going to have a Casino or a Bringing Out the Dead. Macworld 2008 was the Casino of Steve Jobs career.